Our GA National Site, Monument and Building all in one! On Saturday my sweet angel had the privilege of dancing at the historic Alliance Theater in Atlanta. Her rehearsal was on Friday I decided to take the kids to see the Capitol of Georgia since we were in the area. It was also Friday and if you follow my blog you know that starting in the Fall Friday is going to be our Fabulous Fun Filled Field Trip day. After her rehearsal we went to IKEA with a friend and her girls (I hadn't been to IKEA in almost 10 yrs). We had lunch there as well. Since when did IKEA start serving food? It was very good and inexpensive. Rowyn was a little tired and cranky since he had no nap but he really enjoyed several of the monuments. Especially the Flame of Freedom a World War monument. Gwyn was very fascinated by everything and wanted a picture with every thing she saw including a very large old tree. 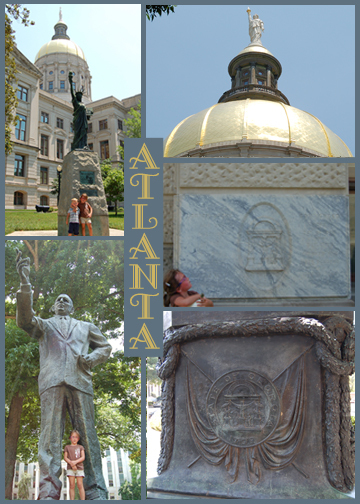 -Atlanta was actually the fifth permanent capital for GA.
-Atlanta was established as the Capitol in 1868. -The Capitol building was completed in 1889. -The Capitol building was constructed using as many products as possible from GA.
-During National Historic Preservation Week in 1977, the Capitol was dedicated as a National Historic Landmark. -The Capitol building consists of 4 levels. -The gold dome on top measures 75 ft in diameter. -Forty-three ounces of native gold, donated by the citizens of Dahlonega and Lumpkin County, GA were applied to the Capitol dome in 1958-59. -A female figure of Freedom,with raised torch in her right hand and lowered sword in her left, crowns the Capitol dome. She stands 22 1/2 ft high and weighs 1250 lbs. on the Capitol grounds in 1907. Since then other Governor monuments have been added. @Stef Layton I'm having a blast. I wish more people were particapating : ( I have my idea already for next week! Loved this!! Thanks for sharing all of that great info about Atlanta! What fun! Thanks for sharing! I love seeing where everyone is going.